Are you fond of posting little notes and reminders on your fridge or on post-it notes? Well if you are (just like me) you'll agree that sometimes it gets unnoticed. This generation of highly innovated gadgets especially tablets is full of distractions and it would take a nice tablet to get their attention, perhaps! Since the kids are attracted to tablets you might as well consider this Boogie Board Jot Paperless LCD Tablet which can really capture their attention and notice what you've jotted for them. 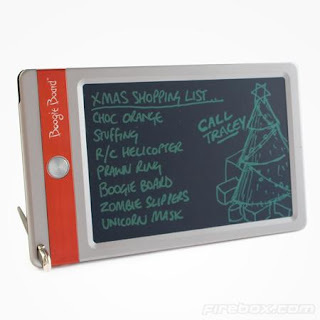 This battery-operated stylus board tablet has been integrated for easier storage and you can hang its magnetized back-plate on the fridge for you to list down your reminders, love message or even your shopping lists. Really love this board tablet which is not only stylish but functional as well.